Jaipuri quilts or razai as they are more popularly called, are famous all over the world as fine examples of superior workmanship from Rajasthan. The talent and skills of thee artisans are more than praiseworthy as they put in tremendous effort to fashion a beautiful and unique handmade creation that not only has aesthetic value but keeps as warm at the same time. The idea of making quilts became prevalent in Europe where duvets were made with down and feathers, and soon Central and South America came up with tightly woven blankets that were extremely colourful at the same time. A Jaipur razai is designed intricately, but is lightweight and fluffy at the same time. A perfect way to describe it would be “comfy and snugly” as they provide an incredible warmth that guarantee a good nights sleep once you wrap it around you – it sure makes drifting off to dreamland a great deal easier! It is an elaborate procedure that prepares cotton to be used as a filling in quilts. Two carders are deployed for this purpose, which are convex paddles equipped with small teeth – the cotton fibres are placed onto of the carders, while the other is drawn across the face of the first one multiple times. The position of carders is transitioned between horizontal and vertical – this is done to remove dross from cotton, which is the waste material. After carding, only soft and fine fibres remain behind – this process takes a full week! The “layering” is when the cotton is distributed evenly throughout the quilt or else it will end up being lumpy at some points while other parts tend to sag. 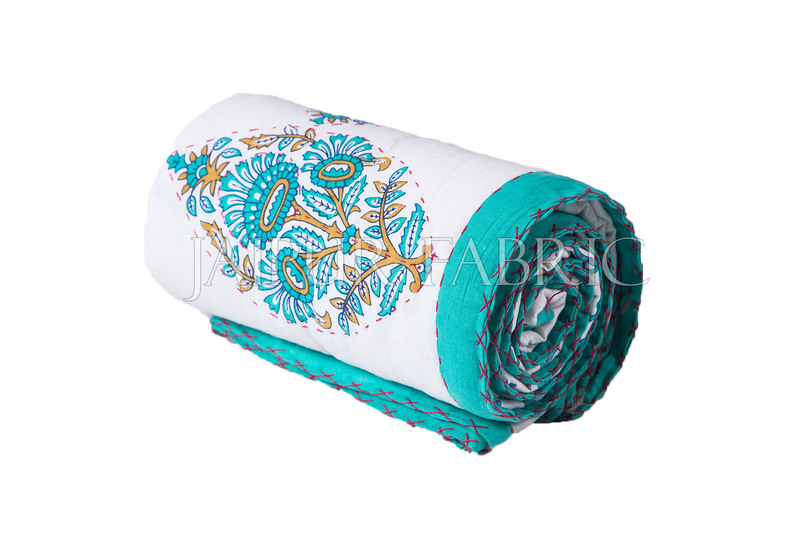 This part is crucial for imparting warmth and cosiness to the handmade quilt – the covering is premium quality cotton voile, which is a lightweight yet gauzy cotton fabric that has a soft and silky surface. At times a velvet cover is used in place of cotton voile. This is the last stage when the quilts are stitched together. Nowadays artisans use machines to do so as it is faster, more convenient, and enhances durability of the quilt, as opposed to using a hand-held needle! This skill is believed to be an inherent quality as whole families of artisans tend to collaborate on these projects with 2-3 generations frequently working side by side. These quilts use stunning and gorgeously designed Jaipur fabric – you will be spoilt for choice!